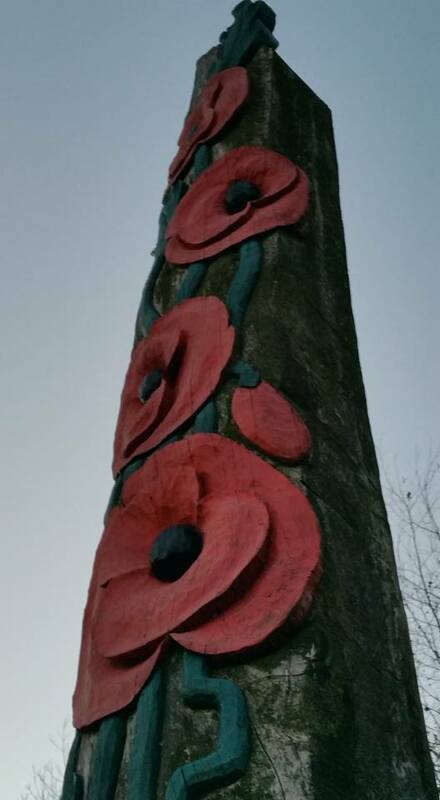 We had hoped to have the Maple and Poppy totem pole in place for last year but sadly a combination of events prevented this from happening,. The team would like to get the Memorial to two Canadian service personnel in place for this summer and if possible Canada Day. If you would like to sponsor this project please get in touch or donate vis the link below, thank you. This image shows a similar carving in War Memorial Park, Coventry. To donate please click on the link below (or cut and paste into your search bar), thank you. Fields of Remembrance - larger areas turned into wildflower "memorial meadows"
There is no longer a requirement to give us your details, all you need to do is pick up a packet of seeds from anywhere (most garden centres have some), but also you can buy online via EBay for as little as 99p for over 80,000 seeds! We haven't counted them we must point out! We have always wanted the Ribbon to be free to join, simple to partake in and as wide spread as possible. It is important to note that when we say a living memorial we mean it. By sowing wildflowers, they will encourage insects, who will attract birds and so on. When the soldiers marched off to both WW1 and WW2 they would have potentially seen many more wildflower meadows than you can see nowadays, there has been a huge decline in such areas sadly. The Ribbon of Poppies hope to change that with your help. 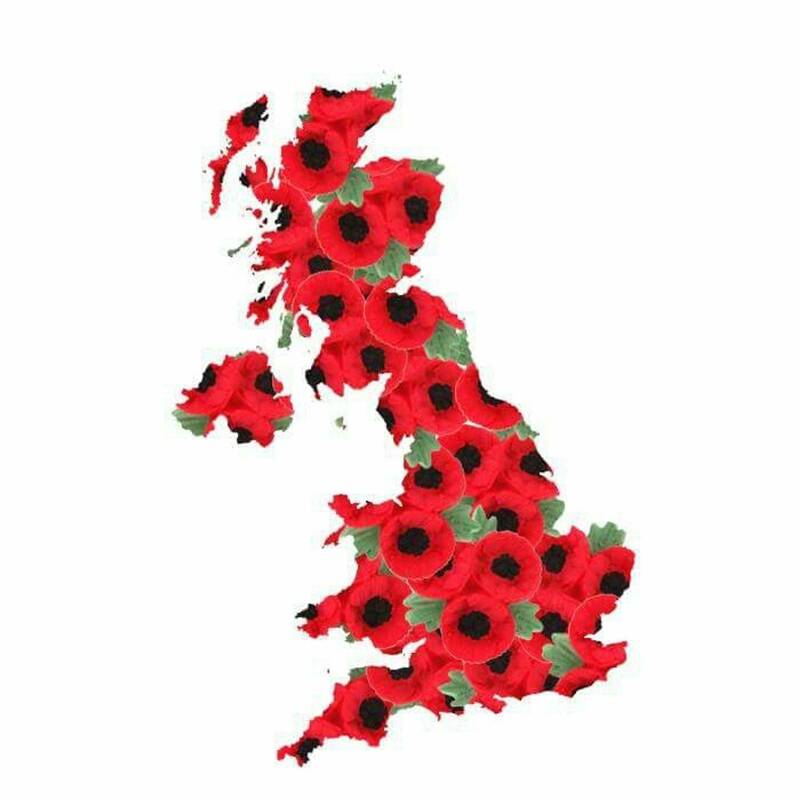 To maintain the work we have we are after passionate and dedicated individuals or groups to help create memorials to remember our Armed & Emergency Services. Planning is now underway to remember the crew of XH117Z of 53 Squadron RAF, and all victims of the air crash of this aircraft into the village of Sutton Wick, Drayton in Oxfordshire. As 2017 will be the 60th Anniversary of the crash we will endeavour to make this a special moment to reflect on the tragedy, whilst looking to the future. If any organisation's locally or nationally, would like to help sponsor this event please contact our team. The event will be held in Drayton on the 5th of March 2017. We will unveil the memorial plaque to remember the loss of RAF Vulcan XA897 at Heathrow Airport on the 1st of October 1956 in a short service of Remembrance starting at 1045hrs (until 1115hrs) at London Heathrow's St Georges Chapel. We hope at the end of the memorial event to withdraw to a rather historic local hostelry nearby. The nearest car park for the Chapel, seems to be the Terminal 2 Car Park (with T3 being the second choice) and the Bus Station and Tube/Train lines are also close by. We are working on a more lasting memorial plaque which we hope to replicate to place in the Memorial Garden at Heathrow and potentially at the Avro Heritage Centre (TBC). If you would like to support this project please contact us or use our PayPal account to make a donation. Thank you. With several larger projects coming up including two 'special projects' in 2018 one to commemorate the end of the Great War and the other to Celebrate the Birth of the Royal Air Force. We have already had meetings with the RAF Centenary Team about one and hope to take the other memorial to the next stage later this year. These projects will not only remember the events mentioned, but we hope at the end of their 'term' to help raise many tens (or hundreds) of thousands of pounds for Veterans Charities. Then we also have of course the National Military Working Dog Memorial project to remember all those dogs that have served with the Royal Navy, the British Army and the Royal Air Force which we would like to gain a canine 'philanthropist' or a corporate partner to assist with these projects. Be part of something 'memorable'. If anyone would like to donate to the Royal Air Force Avro Vulcan XA897 Memorial Plaque we hope to unveil at London's Heathrow Airport in October, please feel free to donate via our PayPal account on this website or please contact us for our banking details so that you may donate to this project. We hope to also install a small memorial at RAF Waddington in the future with any spare funds raised. An idea came to us the other week that a local feature in Iver Heath which is sadly underused and in need of some TLC. May have a new life ahead of it as a small, but interesting (we hope) museum.. In the village there is an old K2 Phone box (the traditional style 'Red Phone Box') which is in need of a lick of paint and touching up. It became apparent that the Phone Box itself was a minor celebrity in its own right, having starred in several of the Carry On Movies! So we are looking into adopting the Phone Box and turning it into something a little special. As long as people don't have it in for me, and they all have it infamy... Ooh stop it... We could go on...but will call it quits! July has been a busy month for the 'Mob' with Busters Memorial unveiling at RAF Waddington on the 16th and what a lovely, if not sad day it was, contacts renewed and new ones started. The memorial looked amazing and its all down to the work of the stonemasons, and Scott Etheridge who helped bring it together, not forgetting local Councillor Stuart, who helped invite local guests (both human and canine)! Busters ashes have been placed inside along with one of his favourite toys as was revealed after the event and the story of how Buster 'gained' his favourite toy, was shown as the top story of the day by BBC Look North. Whilst at RAF Waddington we visited the local cemetery to pay our respects at the gravesides of three of the crew of the next memorial project, the Vulcan Bomber Crash of 1956. We had hoped to place a Vulcan bomber style memorial at Heathrow, but sadly we are allowed only a small plaque, so we hope to now work with the team at RAF Waddington and place a memorial in their garden of remembrance. We have also been busy tracking down contacts at Bucks Country Parks for the Maple & Poppy Tree Totem for the Canadian Forestry Corps. London's Heathrow Airport Chaplains team have also been in touch with us about the October event for the Vulcan memorial project. Also Manufacturers for some of our projects and many more. We also have the #PoppyPaw pin, back in stock, please don't hang around and order before they go, they flew off the shelves last time. On the 16th of July at 11am in the Gardens of Remebrance at RAF Waddington we will be unveiling Busters Memorial. Buster being the dog that saved a 1000 lives, an RAF Police Explosive Search Dog. Visitors will be welcome, however to ensure access, we require details of those attending name/address and vehicle registration details. Those attending will also require photographic ID. Once the event is concluded the team hope to reveal the plans by the Sculptor for the National Military Working Dogs Memorial and we hope to also have information on support from a major charity who may be supporting the Memorial. 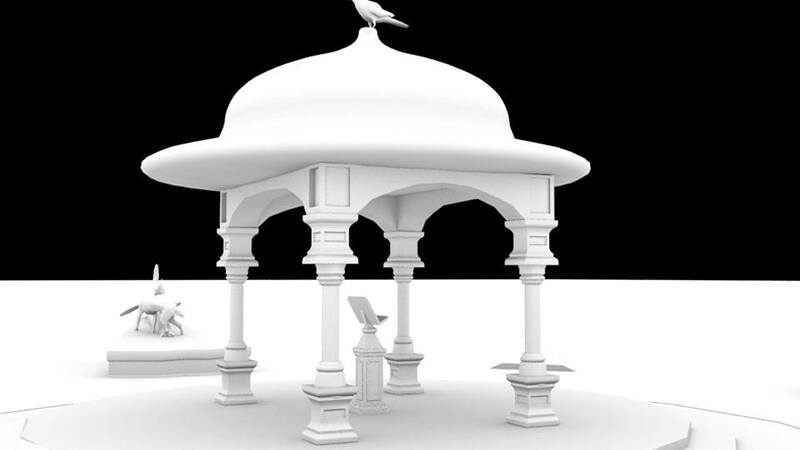 This image shows a draft of the central temple which will be surrounded by four dog memorials, representing the three branches of the Armed Services and a fourth plinth for mascot dogs.